A common, interesting discussion in the US during 2014 has been how large Enterprises (e.g., Government Agencies, Media Companies) were successfully using Meta-Data about individuals and events to make decisions. Popular or not, ‘Meta-Data’ became a buzzword for many. GITS Resources have been successfully implementing Meta-Data Oriented Solutions for over 10 Years. GITS uses a three-layered approach to understanding and managing Meta-Data, via a Meta-Data Repository. The Meta-Data Repository stores the Core, Technical, and Implementation information about each Business Attribute. We customize and populate the Meta-Data Repository to uniquely fit our clients’ needs. We also provide training/training materials on how to maintain and use the Meta-Data Repository. At the end of the engagement the Meta-Data repository is yours to keep. 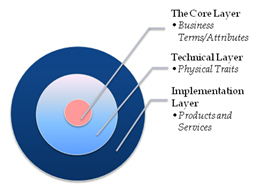 The GITS Methodology defines Business Attributes in a manner that can be used to facilitate Semantic Consistency across these layers, intuitively. This ability is necessary to manage interoperability across Organizational and Geographical Units at a given enterprise. Business Terms that have been defined in the Common Business Language Taxonomy developed for the enterprise (select the ‘CBL Taxonomy’ item on the website Methodology page for more information). The Implementation Layer of the Meta-Data Repository contains information about the Products and Services offered by an Enterprise that are being consumed. Each Product and Service is described in the Meta-Data Repository by Business Attributes. The point of implementation (e.g., Data Layer, Transport Layer, Presentation Layer) is captured for each Product and Service at a given ‘point in time’ (effective date).